Dietrich's power has been insane to start the year, as he has a .500 ISO in 32 PA. He's just not doing anything else well. He has a 1:7 BB:K ratio and .233 AVG on the year. He also has a .158 BABIP, so Dietrich's poor average could be the result of bad luck, however it's hard to have a high BABIP with a 56.5% flyball rate. 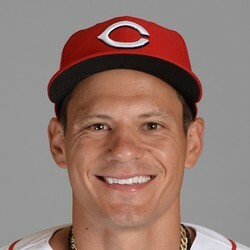 The Reds might want to give Dietrich a little more playing time considering Jose Iglesias is their starting shortstop, but until that happens Dietrich doesn't have much fantasy value.